Today at my local coffeeshop, I saw the aunty preparing empty condensed milk cans for customers to take-away coffee or tea in. This was popular in the old days in Singapore up till the late 70s. After that, coffee stalls prefer to use plastic bags or polystyrene foam cups. The prepared cans certainly look quaint and nostalgic and so I took some photos of them. The aunty was surprised and remarked that only rich people can be fascinated by things like that. "Why is that so?" I asked. "It is only when you are rich, stomach full and have nothing to worry about that you appreciate such simple things," she replied. "But one does not need to be rich to appreciate the simple things in life," I said. "Yes, but people are not like that nowadays," she retorted. Then, she told me that her neighbours' children on their first salary (of mere SGD3,000/month) went off to buy a car, spend all their salary away every month, then ask their parents for money. How times have changed! In my time, with whatever little we have, we still give monthly allowance to our parents. Then, these neighbour's children gone on to have extravagant weddings in 5-star hotels, expensive photo shoots, honeymoon, luxury apartment, and got divorced after their second kid. Isn't it akin to running on treadmills? One doesn't need to be rich to appreciate the little simple things in life. 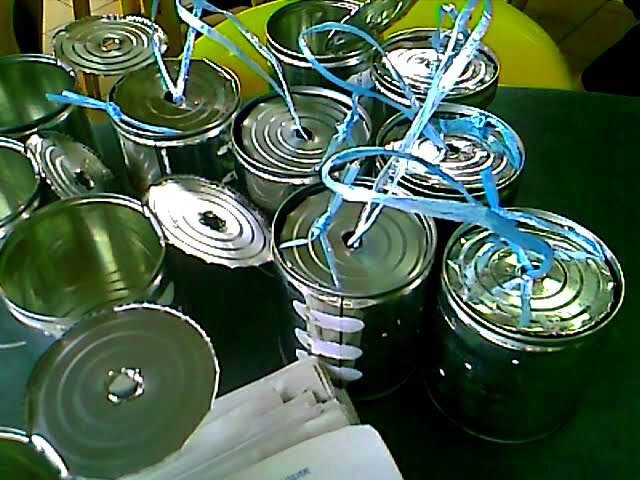 Just looking at the tin cans reminded me of my childhood and the lifestyle of that time. It is a beautiful feeling, and hence the photos. Besides, I am not anywhere as rich as they think I am. So one can be financially poor to appreciate the simple things in life! Perhaps parents in Singapore are too busy working and making money instead of imparting values to their children. As a result, children grow up adoring money and material wealth. After some time, they think that material wealth is all that matters. It is said in jest that when a man is poor, he longs to find a wife and when he becomes rich, he divorces his wife! I told the coffeeshop aunty that my nieces and nephews are lucky as their mother stayed at home to bring them up and so they are inculcated with moral values from young. They love the family and gravitate towards home to be with everyone. If home is where love is, kids will gravitate towards it to find their serenity. Such serenity secures them and cushions them against the onslaught of the daily harsh materialism we commonly find in our societies. Then just before I left the coffeeshop, she marveled that I am well educated and therefore need not take into buying 4D (the weekly lottery). I couldn't believe what I heard at that instance, so I merely shook my head in reflection and left. I really like the way you capture the simple things become interesting news. I do saw a lot of can "cup" but your picture is really Unique. Hope I can have similar object to put on my blogg too. Thank you for visiting Vacuum State. I am flattered by your remarks. I try to see things as if it is the first time I am looking at them. It brings out childlike newness each time.